Summary: For many community banks, the tedious task of managing expectations is still time-consuming and inefficient. But new tools, techniques and technologies are emerging. Segway, the company that brought you the self-balancing scooter back in the day, has now ventured into roller skates. You simply jump on the skate without strapping in your shoes and off you go. They have 45 minutes of drive time on one charge and have a single wheel design. 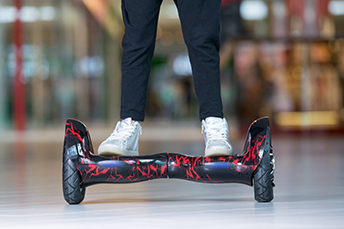 This could be the replacement for the hover board perhaps. As you roll forward through your day today, we delve into various ways banks are increasingly automating their way to greater efficiency, with a closer look at managing exceptions. For many community banks, the tedious task of managing exceptions is still time-consuming and inefficient. But new tools, techniques and technologies are emerging and trickling down from larger institutions to help community banks manage this task. As all bankers know, the stakes are high. More exceptions mean more risk. It's the old risk versus reward struggle. Banks that choose to take on more loan and operational exceptions are typically in greater danger of having potential issues down the road. Exceptions are not just about loans. Indeed, while banks have long dealt with exceptions on the lending side, they are increasingly looking at exceptions in data security, mobile and online payments and other banking services. Policy or operational exceptions, such as wire transfer exceptions or internal audit exceptions are key areas of concern. According to a recent study by Accusystems, 69% of community banks use some ad-hoc combination of manual ticklers, spreadsheets, calendars, email forms, databases and core systems for exception-tracking methods. While this is a step in the right direction, experts see this type of disintegrated approach as inefficient and potentially risky. Understand why exceptions are happening. Through a more automated process, banks will be able to identify the employees who are most commonly the cause of exceptions and the areas where those exceptions are happening most often. After doing a deep dive review, banks can get to the root causes and reduce exceptions to become more efficient. Better measure exceptions. Peter Drucker famously said, "If you cannot measure it, you cannot manage it." By observing and tracking trends in their exceptions, banks can modify processes in ways that reduce exceptions and smooth systems. Create better policies. Automation tends to help define policies and procedures across the board. By creating an automated, more consistent approach for handling exceptions, banks will gain a more clear view of where it may behoove them to change or modify existing policies. Fed Governor Brainard said the economy "remains solid" because of high consumer and business confidence levels and fiscal stimulus. She said the Fed should continue with gradual interest rate hikes over the next 2Ys, barring any unexpected events. According to BCG and MIT, RBC and Israel Discount Bank are the frontrunner banks in using artificial intelligence (AI) worldwide, while most other banks and companies have a gap between ambition and execution. Their report emphasizes "one sizable difference" between AI leaders and laggards--their approach to data. Among executives across industries, only 5% has extensively incorporated AI in offerings or processes and less than 39% of all companies even have an AI strategy in place. Fidelity research finds 401(k) accounts with a balance of $1mm or greater hit a record in Q2 and jumped 41% from last year.